1) Check frame and engine numbers against the log book. While many Lambrettas could have had an engine change due to improving the performance, or broken casings etc, the correct details for buying an original machine are important. If speed or originality are not important to you then this is not such a great problem, but certainly at least the frame number must match the log book. Check the area of the frame number itself, as certain Lambretta machines become rarer, unscrupulous characters out there have been known to "ring" the top models. Ringing is giving a false identity to machine. i.e. taking a Spanish built Serveta and turning it into an Italian numbered machine means you have not brought what you thought you had, the scooter is also illegal and could be confiscated and even crushed if found to be incorrect. This scooter was in a copy of Scootering magazine for sale at £1450.00, offered as an Italian import with LCGB certificate! Of course it is not an import from Italy, but from the Far East, we can tell this because of certain trims, badges and general bodges always seen from bad restorers in this part of the world (were not saying they are all the same, there are good shops also, as there is good and part in all parts of the world). While this particular scooter is genuine, it is a good example to use due to some bad bodges on the machine to try to show what to avoid. Although it is not clear in this picture, look closely at the frame number. We are looking for a nice even stamping of numbers, no signs of tampering or differing heights in numbers, heights, etc etc..
All Innocenti Lambretta (except one) carry an IGM number, also make usre there is one present, and try to find out what that should be as each model range had its own number. The IGM is the type approval number, which every thing made in Italy must have. 2) Imported machines that we see so many of do not tend to suffer from rot and rust, what damage you normally find will be visible instantly. Leg shields and panel work can be quickly inspected for rust holes and dents. In general Lambrettas stand up to the elements of time very well, the machine would have had to be very badly stored for it to be totally rotten and useless. The main frame tube is very well made, although I have seen some horrors on scooters imported from third world countries, and of course Italy itself, in general the main tube is solid apart from where the number plate is located, this should be checked for rust damage. It is not unknown for some importers of scooters to stand the scooters on this number plate part of the frame to cram more machines into a container. Check panel alignment and general alignment of the number plate area as this can easily be damaged by this practice. Leg shields normally rot at the bottom, where you would put your feet, in particular where the channels are fitted should be looked at closely as these can act as a water trap. Follow the Leg shield beading down to the bottom and the top, again there is an alloy end cap at each end, try and check under here as this is the most common place for Leg shield splitting. Rear floorboards will unless the machine has been restored, will almost certainly be split. They tend to split right in the middle, as passengers tend to put their weight on them when getting on the machine. They are a foot rest, and really will not stand continual heavy weight. Side panels should be checked inside and out for signs of dents and damage. Side panels can also spilt, on the main frame the is a leg that comes down by the petrol tank, the side panel rests against a rubber that sits on here to stop it vibrating. Trouble is with years and years of being pushed out slightly by this rubber the panel is known to split at this point. Again easily visible and repairable. In bad cases side panels can rot at the very top and at the lower edge, but this can be easily viewed unless hidden by many layers of paint or power coat. On any body work and good easy check is to take a small magnet with you and run it over the body work. The magnet will not be attracted to layers of filler, or holes botched up. 3) Get underneath the scooter, the main strut that the stand is fixed to, can quite often break away from the frame itself. This will cause the scooter to wobble on its stand, not sit straight on its stand, and at worst distort the leg shields. Whilst this is easily fixed with either a new strut, or re fixing the original, it does involve welding. If the scooter has nice paint work then of course this will be spoilt by the welding needed to fix this on. If this problem is on a scooter that is to be restored, then there is no problem as this can easily be rectified during restoration. Examples on the left show you what to look out for, don't buy one like this! Although you cannot see for certain in this picture, the main Leg shield strut has broken and been re-welded. No problem with this it is quite common, but if you repair it, it needs to be straight! 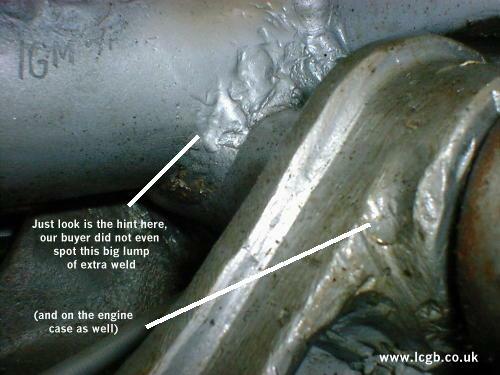 Again not really a problem, but bad weld on the front strut is visible. 4) Headset top and bottoms should match nicely, if during the machines history either the top or bottom headset has been damaged, or changed for some reason, it can often be quite hard to match the top and bottom so they fit nicely. For example many Lambretta GP machines out there may have had an Indian headset top fitted, also Li Special, SX and TV machines could have had Spanish tops fitted. You can notice they do not line up properly but looking at the headlight rim closely. Headset top and bottoms never rust, but they can suffer from alloy corrosion if left to the elements. Mainly this is easily fixed with heat when stripping and alloy part, but they can also be brittle and break. We have not done this picture in a larger version because there is nothing wrong with it. The reason we show you it is because it does not have a chrome ring. The letter that came with this scooter from the LCGB correctly states it as a 1963 by its frame number. If the buyer had done his homework, he would have known a 1963 TV175 had a chrome ring under its headset! This could be down to a bodge repair, fitting the wrong parts or ringing. 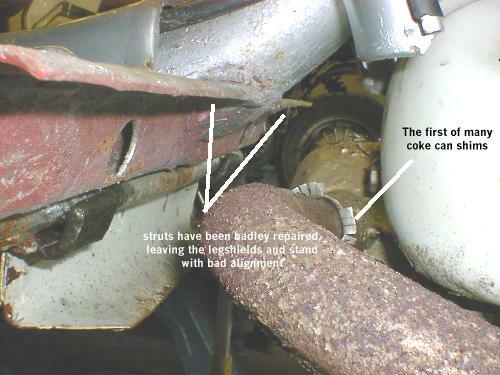 5) Internally the main problem with scooters that have been stood for years is rust inside the petrol tank. Take the lid of and run your finger around the top of the tank. If it feels all gritty you have a rust problem. This can be cured by treating the rust, quite a few methods are available, or you could just replace the tank. Tool boxes are generally fine, owners drilling holes or dents are their main fault. Plastic tool boxes on the other hand can become brittle and discoloured with time, check these at their mounting points more carefully. Air boxes rarely suffer from rot or damage, the most damage you normally could find on stripping the scooter is the captive nut at the top that secures the air box. Rear mudguards can suffer from rust holes and dents, try to pay attention to the rear of the mudguard in particular. 6) Wheels and hubs can easily be replaced, wheel rims are cheap enough not be concerned about. Rear hubs can be considered a serviceable item as they can wear. The most important thing to check is that the two wheels are in alignment with each other. A correctly executed M.O.T will check this. Normally they place a "straight edge" piece of wood or metal so it touches both wheels. The straight edge should sit flat against each wheel from both sides. If one wheel is not flat against the edge, the most common fault would be worn engine mounts. 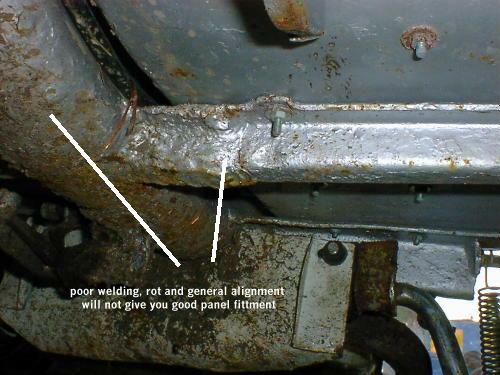 Twisted or bent frame should also be checked for if the wheels do not line up, if in doubt I would seek expert advice. It is very common with cheap "restorations" to see the front forks, bolts etc painted without being stripped. Not only does this look horrible, but also shows that no care has been taken to check 40 year old suspension, at least it will fail the MOT, at worst in can lead to poor handling, UN even braking & tyre wear. Tyres, the side walls and rear suspension should be checked, these are so cheap now ideally they should be new, or replaced on an machine brought for restoration. Although not the best angle to take this picture from, here you can see that the rear wheel is leaning over to the side by some amount. This is particular example is quite bad due to the frame and engine case damage seen elsewhere, but others are not so bad but still as dangerous. Front forks are badly corroded, but painted and patched in any case. If rot is allowed to continue in this area the forks could just fall apart if you hit a rut in the road. Front hub has been welded and messed about with to make the TV disc links work with a drum brake! 7) This leaves us the engine, the heart of any vehicle. The basic design of Lambretta engines from Li series one to the last GP share the same family of design, and more often then not are fully interchangeable. 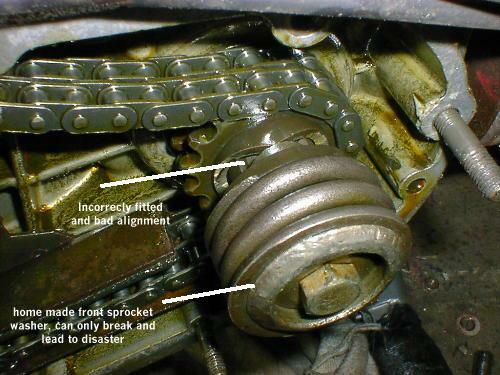 Main points of concern cannot really be checked until the engine is in the workshop and stripped. 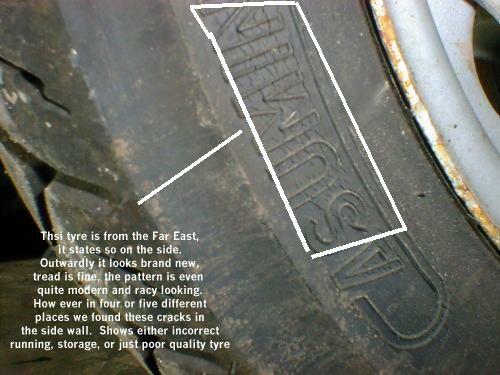 Obvious checks can be made to the outside, but this is mainly for damage and worn threads. Check the engine side casing, this is held on by many studs and nuts, or in some cases bolts. The threads on the actually casing itself quite often can deteriorate due to constant removal / refitting, or over tightening. Are all the nuts/ bolts tight and in place. Around the flywheel and cylinder cowl similar problems occur, this will normally allow the respective cowling to rattle and vibrate and should be easily detectable. Check the rear hub, grab the tyre at the three and six O'clock positions and try to wobble it. Almost all Lambrettas have a very slight amount of rock, this is quite normal, but excessive rock or clanking noises at worst could need a complete engine strip to replace the rear hub bearing. Early models were fitted with MA/MB series of carbs, many of which leak and suffer from lack of spares. The later SHE series of Dell'orto carbs are often still serviceable, spares are fairly readily available, with only weird threads really the main problem on these carbs once they have been overhauled. 8) Test drive the scooter, if your going to do this on the open road as I suggest you do, are you actually insured to ride it? Start the engine, and make sure you go for a test drive long enough to get every thing warm, not just down the end of the drive and back, this will get every thing warm and at correct running temperature. While out on the test drive check the gears, most selection problems can be down to badly adjusted cables or worn outer selection bar, easily fixed. Try the scooter in second and third gear while riding, accelerate hard, most internal problems will cause the scooter to jump out of these gears. Normally the selector itself will be at fault, this part is readily available and cheap enough to replace, but it also requires most of the engine to be stripped to be fitted. When the engine is hot, does the scooter idle properly, check there is no white smoke as this can mean an oil seal is defective. 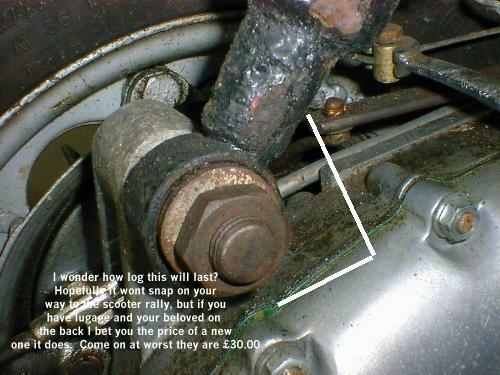 Again oil seals are very cheap but the not so mechanically minded would have trouble fitting them. Check suspension and steering while riding, steering should be straight you will easily spot incorrect alignment as the headset will point off centre while you are riding in a straight line. Bounce the scooter, if the front or rear bounce more then twice it needs repair or replacing, easily rectified, just a pain to have to do it. Ask the seller to take the spark plug out, check the colour is a chocolate brown colour, a good indication that all is well. 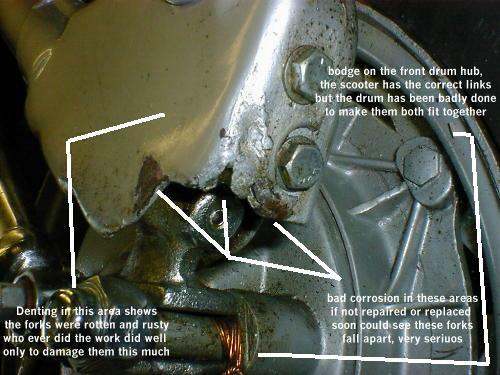 Stop the scooter when hot, try to re start it, ill serviced Lambrettas are often quite hard to re start when hot. Although this can quite often be easily fixed, there are a whole host of reasons why they do not re start, time and trouble is more the problem then a major or expensive fault. Unfortunately our engine write up could do with a whole page on its own, our buyers TV175 came with a whole host of horrors leaving this TV fit for one thing, scrap metal. Lets start with the casing itself, so badly repaired, you will have seen on earlier pictures the rear wheel is at a terrible angle, then we opened up the chain casing to find the following horrors. The chain was in terrible condition, rollers missing, chain so stretched it could quite easily fall off and jam the rear wheel totally. Front sprocket retaining sleeve was home made, this can quite easily break and cause major damage. The following group of four photos, show that although this scooter is supposed to be a 175, it is fitted with a 150 top end. A couple of cooling fins were broken off, no great problem, piston although new is of poor quality. Next we have the crank shaft, looking closely we think this is a standard Li crankshaft. 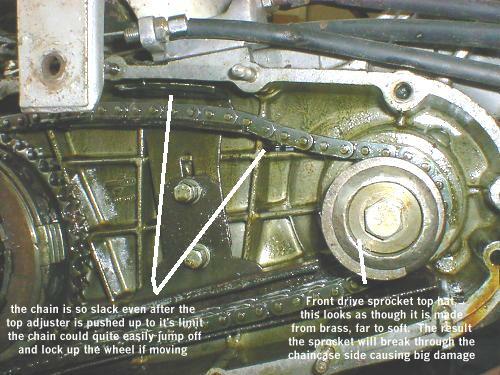 Notice the Innocenti markings on it, a forty year old crankshaft well beyond serviceable condition. 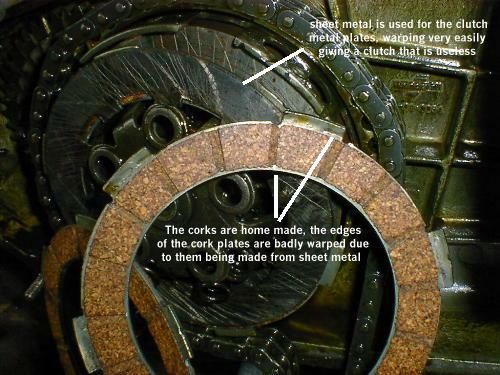 The clutch is the heart of most machines, transferring power from the cylinder to the gearbox, it is quite important. 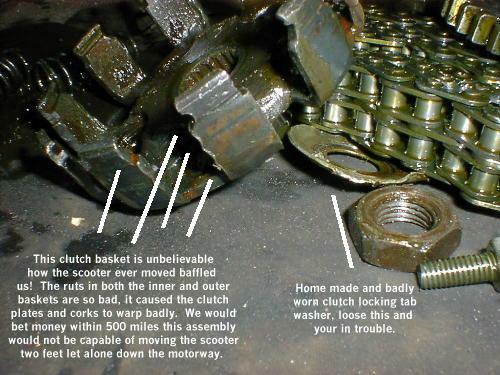 So important for our buyers scooter who ever did this took the time and trouble to make on, only not very well is our big problem. As well as the clutch being useless, the clutch basket, rear sprocket and complete assembly is beyond belief as to how bad we found it. No way would this have lasted more then a couple of hundred miles at the most. 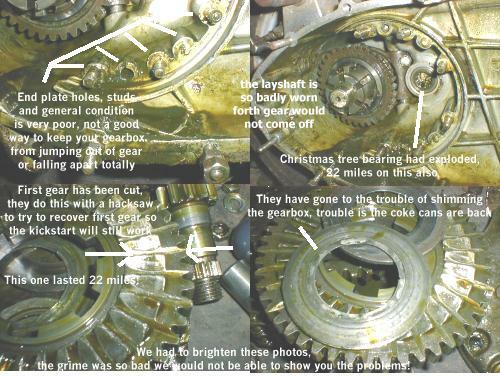 We'll let the gearbox pictures show you the horrors in here. Just click the pic to see more! 9) Finally modifications, many many Lambrettas for sale out there have been personalised or modified by previous owners. Some modifications are well worth it, such as electronic ignitions, others are more personal such as crash bars, lights and mirrors. The reason I mention this is if you buy a scooter with crash bars fitted and you do not like them, you will be left with two holes in the leg shields when you take them off. The same can be said with any accessory you intend to remove if you purchase the Lambretta, check that when you remove the item no horrors are underneath. Engine modifications are probably by far the most common upgrade, as the Lambretta is more then likely over thirty years old, improvements or modifications to make the Lambretta keep up with modern traffic will have occurred. Most adverts will display a whole host of modifications carried out, owners are normally proud to reel of the long list of modifications. Just remember the more exotic modifications will be more expensive to put right should they fail. You could quite easily write a book about all the different modifications, some are good, some well lets say just ask yourself if this is the type of modification you want. Is the product fitted still available for purchase, important for replacing parts that go wrong. Many modifications while giving you more power, will also give more wear and tear on the engine components inside. How long ago was the modification carried out, this is a hard one as if the modification was good and not carried out that long ago, why is the seller selling after spending that much money on such an improvement. If the product is not know to you or friends, and has been on there for many years, what happens when it goes wrong, can it be easily fixed? Colours and paint schemes again are a personal thing, this is purely down to whether you like it or not. Engraving and chrome on customised scooters should be treated with caution if you wish to return the scooter to original spec as it is virtually impossible to remove engraving, expensive to de chrome items and to return to original condition. On the other hand if this modification is to your taste, then this is a bonus as engraving and chroming can be very expensive to have done properly. These models in the UK are not as popular as the later models as they cannot be tuned for reliable fast use with many machines topping out at fifty miles an hour, and taking a long time to get there. 3 speed gearbox is the only let down on these scooters, the gap between second and third is on the large side. Many Lambretta enthusiasts actually regard them as the last real Lambretta, very well engineered, mostly open framed apart from the "L" versions and shaft driven. Many new trims, badges, lights, etc are available, but in general these early models are a bit harder to get hold of parts for. There is only a handful of shops / experts that stock a good range of parts. Technically these models are very good, if cared for and serviced well, they can expect to cover over 40,000 miles without a major overhaul. If a major overhaul is required, take care as some of the engine parts can be both delicate and tricky to fix. General servicing and maintenance is pretty easy on these models. Body work in good condition is hard to find these days, so make sure all is complete and not rotten. Early frame breather series 1 have a single oil seal on the stator side of the crankshaft which is lubricated by the fuel/oil mixture feed through a small channel. Ideally this needs to be upgrade to the later style magneto housing to be used as a reliable machine, some engineering is needed to be able to do this. Check that the rubbers are in place and useable for the air intake system on frame breather models as finding replacements is currently very hard. Single piece criss cross channels on the front floor of the leg shields can be expensive to replace but are readily available from most good shops. No new body work is currently made for the S1 apart from a few odd Indian parts which are different in shape. All badges and trim, including seat covers etc are easily purchased. Mechanically virtually all parts can be brought off the shelf. The TV 1 is quite a rare machine now due to the low numbers made in the first place, kick start and gearboxes can be difficult compared to the more normal arrangement of later models. Genuine seats are often impossible to find, and command high prices for good examples. The TV 1 had a seventy mile an hour speedo, again because it was only fitted to this model is quite rare. Seek specialist advise if the chosen machines needs any work, expect parts fitted only to this model hard to find and expensive. Not really recommended as a daily use machine, the TV1 is more a collectors scooters due to its rarity. Changes on these machines make them more accessible and easy for "general ownership". Only the seat of the TV 2 is hard to find, with most other trims and badges re made now. The third series of Li can often be considered as the entry level to Lambretta ownership. This was due to the fact that this models production was the largest of any other from the Innocenti factory. Many examples still exist in Italy today compared with other models, this model tends to be because of this one of the cheapest models to purchase to start with. Pretty much built proof engine wise, due to the high quality of workmanship and engineering from the factory, these models also had relatively low engine power giving less wear. Electric's, especially on earlier four pole systems can sometimes be worn and in need of replacement, but funnily the Lambretta electric's are of good quality from normal suspect Italian suppliers. Many machines still run quite happily on forty year old stator systems, but expect spares for these to become harder to find, leaving the fitting of an electronic ignition needed. Side panels, headset top and bottoms, front mudguards, and horn casts are possibly the hardest parts to find as none of these are re-made. Leg shields are now re-made by a UK company, rear floorboards can be changed for Indian GP items. Trim and badges are all readily available without exception. The special is probably one of the most popular machines for Lambretta owners trying to find a suitable machine. Although not many examples were sold into the UK originally, especially the 125cc version, many imports brought in now make this machine more easily found. The Special is more sought after then the basic machine, as in my view it shares the same looks as the TV and SX machines, many of which are harder to find so people settle with the Special. Headset top and bottoms along with horn castings are not currently in production, most other body parts can be easily found. Mechanical parts, trim and badges are all easily purchased. The Special model was available in three different limited edition models, the pacemaker, the Silver and the Golden Special. These we always either just a "badge stuck on the machine" or in the case of the Silver and Golden, a standard machine, painted in its respective named colour, with additional badgeing depicting its particular name. The trouble with these models is that there were no records kept of production frame numbers or amounts produced. Don't be fooled into paying a premium for one of these models as they are identical to normal specials apart from these items pointed out. You can very easily fake a Pacemaker, Silver or Golden special from a normal Special, so buyer beware also. The TV175 was the first two wheeled machine to feature a disc brake from the production line, whilst the disc needs careful looking after and maintenance, it is a worth while addition. Front dampers were also fitted to these machines to improve handling on the flag ship scooter of the time. TV175's are starting to fetch higher prices do to these two features as the more sort after 200cc TV and SX become almost impossible to find. The TV under went production changes in its life span, mainly the side panels were a different shape. Early or late seems not to affect price or desirability, so either version is worth considering. As with the Specials, headset top and bottom along with horn casting are not currently made. Disc brakes used to command very high prices on their own, but are now re made to a very good standard bring the prices to a more acceptable level. The TV200 or GT200 as it was known in the UK was made specially for the UK market to start with. Power mad UK buyers demanded more cc's from Innocenti, but their reluctance to make such models was proven when the made the UK importer honour all warranty claims instead of the factory footing the bill. The TV200 is probably regarded as the flag ship scooter to most collectors, being made in less numbers then the SX200 makes this model one of the hardest and most expensive models to find and buy, sometimes even fetching more then the very early A & B models. The SX150 and SX200 visual basic difference apart from a few trim and badges, was the side panels. The 200 model had its own more arrowed version of single flash each side compared to the 150 model. The 200 models apart form the bigger and more powerful engine also had the disc brake and front dampers set up as per the earlier TV models. The main point to be wary of in buying an SX200 is that it is real, and not a faked version built from a Spanish built machine. Spanish built SX200's and later Serveta badged models do not command such high prices as the genuine item, so check carefully frame and engine numbers. On feature normally hard to disguise in faked models is that the Spanish built machines had flat squarer type engine mounting points on the main frame, where as the Italian models had circular tubes. I would highly recommend checking the frame number area as well for signs of tampering and weld marks, to be sure you purchase a correct model. Innocenti stamped numbers were always very precise and clean, following the curvature of the frame, Serveta models on the other hand were stamped in a more straight line and were not as clean and tidily done. Genuine models currently command high prices, and unless this is the model you really want, choosing or settling for a "lesser" model could often save you thousands! The UK market was unique in calling this model the GP, after the Gran Prix racers of the time which was very popular in the UK at the time of launch. All other markets this model was called the DL. Again the 200 models quite often suffer from being fakes, as later less desirable Indian models can be fairly easily cloned to be Italian. The rear tube of the frame needs to be checked as Indian models had an extra strengthener, although this can be removed inspect very closely for tell tale signs. 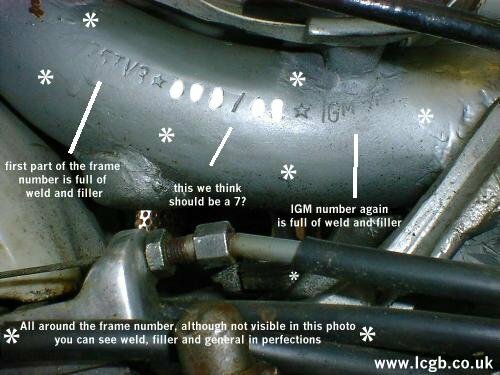 Frame numbers as with the SX above need to be checked closely for signs of re stamping and replacement. The last two wheeled production machines to come from the Innocenti where the Electronic models of the GP. Again these suffer from faking quite considerably. Genuine Electronics do command a small premium in the standard GP200, and as the exact chassis number that the change over from non to electronic was made, you should be careful of buying early models in particular. Pay attention to the mounting point for the regulator as often fakes can be found out by this point alone. The GP is probably the most heavily customised and modified model used by owners to personalise, original examples are now very rare to find in factory condition. All parts and body work can be purchased new as at present the Innocenti factory is still in production in India. The Indian government brought the factory and still continue to produce many parts. Some have deteriorated in quality quite badly, and genuine Innocenti parts always attract a premium in price. Often not liked in the UK due to the lack of customising and performance parts available off the shelf. 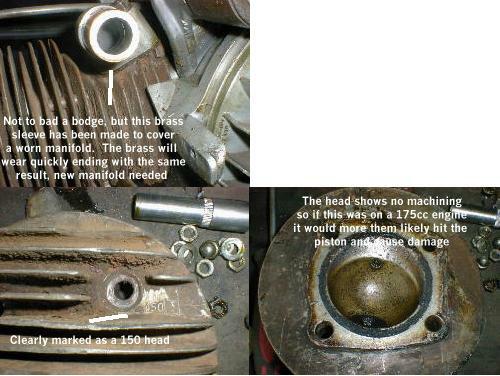 Parts are always harder to find, although second hand parts are always fairly easy to come by, especially engine items. In general apart from a handful of enthusiasts this model would be best avoided, the lack of new parts, will nearly always allow you to spend more then the scooter is worth on any project you under take. The luna line although way ahead of its time in terms of style and performance, never caught on as much as its bigger cousins. Although the Vega and Luna machines were very clever for their time, they did suffer from vibration and lack of ultimate top speed for the UK buyers. Although having said this the Vega was very quick for its small 75cc engine, styling was way ahead of the game even by Japanese standards, and customers at the time seemed to be reluctant to stand out. Had the Vega been launched a few years ago in the nineties, I believe this machine if it had been up to date technically would have created a new sensation, perhaps in the seventies it was just to far ahead if its rivals in the style department to catch on. Spares are limited to more specialist Lambretta shops, some parts are impossible to find but on the whole most spares can be found. Leg shields due to vibration and Lambretta riders robbing them for customising purposes on other models can often be hard to locate. The Lambretta 30cc and 50cc mopeds were never imported into the UK as official models, so little is known about these machines as still today only a handful of private imports have made it to these shores. Speed wise they are; taking into consideration their age, impracticable to use on the fast UK roads without caution. Very few spares, probably only available from one UK shop would be obtainable. Lambro three wheelers are extremely well made, although again parts supply will be the main problem apart from finding one in this country to start with. Most machines are probably coming over imported from Italy now, although they do tend to be in good condition for their age. Brakes and electric's should be in good condition, but more and more parts are finding their way onto the market. Most Lambros were pretty restricted due to gearing to a top speed of around 35mph, so only town work should be considered if using as it daily. If doors are important to you (most we purchased as an extra option) make sure you Lambro has them as there are so many different types, the are near on impossible to buy afterwards. Unless the Lambro has been used on regular basis, brake cylinders will almost certainly need overhaul. The law is clear; you are covered by the Sale of Goods Act 1979.
bearing in mind its age, what it cost and how it was described to you. It should be free from defects, other than those you were made aware of. As described. If the dealer says it's a 125, and it's actually a 200cc, you can reject the scooter. It's an increasingly common problem, as owners modify their scooters. Fit for any reasonable purpose. The scooter should do all that you reasonably expect of it, including any specifics you state to the dealer. If you need a scooter for the rallies, for example, and the dealer says a 125cc 1957 LD will be fine, you can reject the scooter if it struggles to stay up with modern traffic. However, if you pay for the scooter to be inspected, the dealer is not responsible for any faults that the inspection should have found. It is always good to get a statement on the scooter's condition from the dealer. If your scooter is faulty or has been incorrectly described, there's a short period after buying it in which you can reject it. But you must stop using the scooter immediately, and contact the dealer directly. You also need to follow this up in writing, providing evidence of any problems. Now the big problem with a Lambretta and your rights under this act, and you'll notice I highlighted the following "bearing in mind its age" and Fit for any reasonable purpose text above. It has to be said in defence of dealers, would we all really expect a 30, 40 or 50 year old vintage scooter to start first time every time, come rain or shine or would we expect a few problems, given its age. Can you reasonably expect the same scooter to get you 2-300 hundred miles to a rally every other weekend even though when sold new they were only ever designed as a shopping bike!? Horses for courses, you must be prepared when buying a Lambretta that it IS an old classic vehicle, who ever has repaired, sold or even fully restored it for you. You have far less legal comeback when buying privately. The only obligation for sellers is to describe the scooter truthfully - but even if they don't, getting compensation from them can be difficult, time-consuming and costly. However, you can still expect the scooter to be: Capable of passing an MOT, unless the seller specifies that it isn't. Owned by the person who is selling it - because if you later find out it's been stolen, you have no legal right to keep it. It will also be covered by the Consumer Credit Act 1974. This means if you buy a scooter and find out later a finance company has issued a claim against it; you are still able to keep the scooter. The finance company can't repossess it against your will, although not many Lambrettas have outstanding finance on them these days! Another problem comes when small dealers or traders try to pass themselves as private sellers, a good tip is when phoning to ask about the "SX200"; is to ask do they still have "the scooter" for sale. If a trader has a few different scooters for sale, they will need to ask you which one. It is also totally illegal if you are a dealer in anyway to try to pass yourself as a private seller, your advert MUST state you are trade, this is down to you and not the magazine or website where you advertise. The law and Inland Revenue regard that if you buy and sell over 8 vehicles in any one year, you are classed as a trade seller, and as such you are liable to pay tax on any profit you make, BEWARE! So the warranty and what's it worth? So many people get conned into warranties that aren't worth the paper they are written on, used car ones are the best example, but there are plenty of others out there. If papers are offered for a warranty, read the small print, read exactly what is covered, don't just assume. If the scooter stops working, unless the item is covered by the warranty, just because the scoot doesn't go, it doesn't mean the warranty or scooter shop MUST fix the problem. If no paper work is offered, ask the shop exactly what they will cover and for how long, within reason ask them to put this in writing for you. I know many shops that will offer you a gentleman's agreement on a warranty that are far better then written warranties, but still ask to have something in writing if at all possible.